Last night was a bad one. To avoid the noise from cars pulling up to use the toilets close by, we moved further around the site to join the HGV’s. Unfortunately we then had the noise of their engines running on and off all night, either to maintain cold temperatures in the trailer or heat in the cab for the sleeping driver. On top of that we were really cold. In the morning the thermometer read 6C inside the vehicle. We had not run our hot air heating system overnight because when we had done so at Alvarado it had set off the fire alarm presumably because the system was new and needed burning off. We didn’t bother with a shower as it was too cold and just got back on the road. We were carrying 50 gallons of fresh water for our planned wild camping across country which wasn’t really happening. This added considerable weight to the vehicle and we had bottomed on a few occasions, particularly in shopping malls. The scenery was interesting but not too spectacular enroute to Williams, Arizona. Gallup was the only community of any size, and appeared to offer a good range of shops as we passed over it on the flyover. There we stopped to top up the fuel tank before moving the vehicle away from the pumps to a parking space to have lunch. Stretching my legs around the vehicle I noticed to my horror some minor vehicle damage to the rear left corner. This left a nasty taste in the mouth, I felt quite guilty as the driver yet I could think of nowhere it could have happened. We eventually concluded that we were clipped by another vehicle in the busy car parking area back at the Rest Area last night sometime before we moved to join the HGV’s. We had left it alone for a while while we went to stretch our legs. Rosina rang ahead to the campground at Williams to book the site together with the train ride www.thetrain.com up to the Grand Canyon’s South Rim with an overnight stay up there in a hotel. To our horror the hotel had no rooms available. We then debated the options and decided to forget about Williams and the train trip as it was not worth paying the train fare to go up and come back down three hours later as a day tripper. Instead we headed for Flagstaff where perhaps we could get a coach trip up to the Canyon, or hire a car. We entered Flagstaff and took an immediate dislike to it – far too commercialised, too big and too busy. I went to a DIY store and bought a tube of clear mastic ready to seal the new locks on the outside lockers and avoid any more broken keys in inferior locks, bottoming the vehicle a couple of times again. We’re going to have to keep the RV out of shopping malls as it’s not a car; we would just have to accept the vehicles limitations. We decided to make our way to Williams www.williamsarizona.gov as planned and try and sort something out there. On arrival we went straight to the railway station to book tickets and enquire about the possibility of accommodation (the company which run the train also have a tie-in with the RV campground and the hotel at the South Rim). The staff were very helpful and put us through to their contact at the hotel and we managed to book a room there, not cheap at about $160 a night which didn’t even include breakfast. Still we’d come this far and didn’t want such things to stand in the way of enjoying a trip to the Grand Canyon. 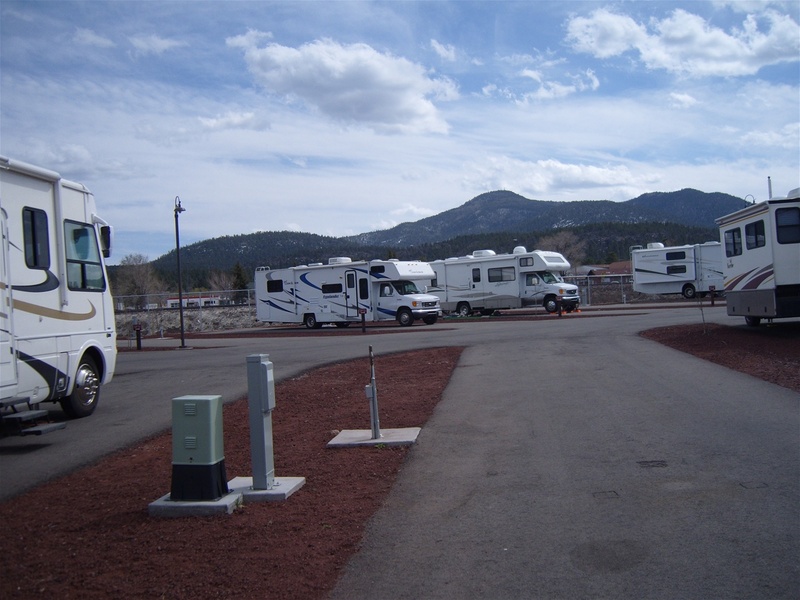 We’ve booked the train tickets and are going up there tomorrow (Saturday) and back Sunday afternoon staying at the Maswik Lodge Hotel tomorrow night and the RV campground here in Williams for three nights. We parked up, hooked up, and packed a bag to take with us tomorrow, together with backpacks, cameras and spare batteries. We’ve set the alarm clock for 06:00 but have no confidence in it working. LOCATION TONIGHT: Grand Canyon Railway RV Park, Williams, Arizona. This morning we left Roswell to make our way to Lincoln on US380. According to the guide books it is a frontier town preserved as a State Monument. The scenery from Roswell to Lincoln was quite interesting and markedly different from the scenery as we entered Roswell. This was more desert than farmland but still had the obligatory scrap cars, farm machinery and general scrap rubbish which we’d seen all day yesterday. 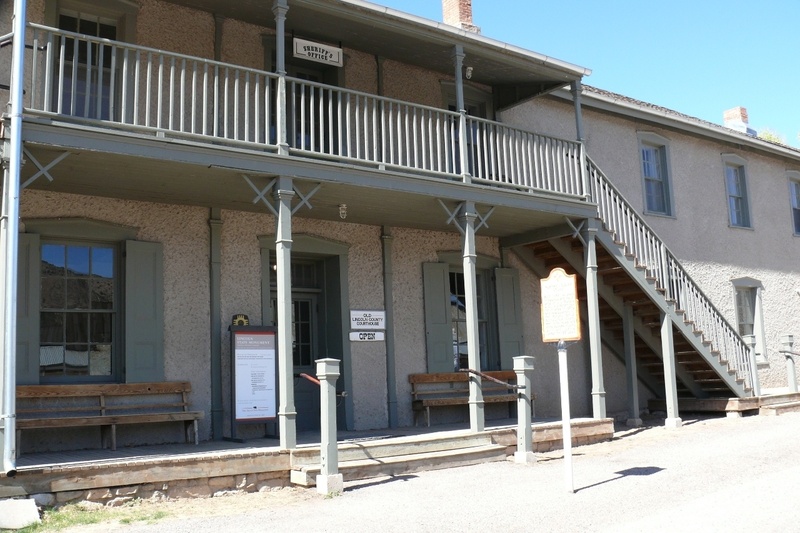 The frontier town of Lincoln, home of Billy the Kid, was a big disappointment. 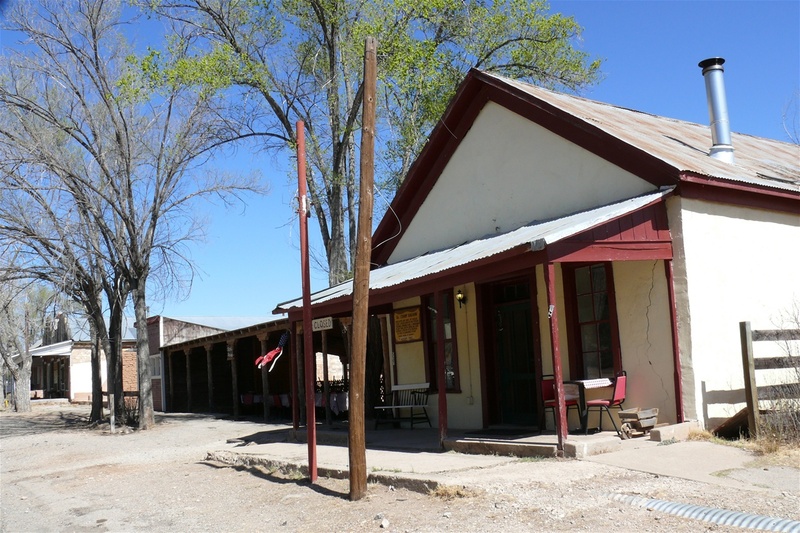 Because it had been designated a state monument we imagined there would be a large car park to leave vehicles at followed by a short walk to a pioneering town preserved as it was in the Wild West days. Nothing of the sort, US380 runs right through the town and we couldn’t find suitable parking for the RV and ended up parking it on the side of the road just out of town and walking all the way back. We accept that we’re travelling out of the peak tourist season but this place was as dead as the grave, and not terribly impressive. We were pleased that we hadn’t travelled too far out of our way to visit it. This now threw our plans out because we had filled the tank with 50 gallons of fresh water at Roswell; Our plan was to wild camp in the Lincoln area having spent all afternoon there, and then set out tomorrow towards Williams via Albuquerque wild camping a second night. As it turned out we were only in Lincoln for about an hour and a half and so set out towards Albuquerque to see how far we could get before the end of the day. The scenery from Lincoln to Albuquerque, New Mexico, along the rest of US380 was spectacular. It was quite mountainous, and the views from the high points were wonderful, it was a mixture of mountains and plains stretching for mile after mile. It was easy to imagine the Native American Indians hunting buffalo down there on the plains. We passed by the entrance to the ‘Trinity’ site on the White Sands Missile Range where the world’s first atomic bomb was tested on July 16th 1945. Apparently a stone memorial stands at Ground Zero, where the blast melted the dirt in to a green glassy substance called Trinitite. It is open to the public on just two days of the year, the first Saturdays of April and October and had we kept to our original schedule we could have joined the single file escorted convoy from Alamogordo in to the site in two days time. It is quite disappointing as we will never have another opportunity to do so. Once we’d joined I25 heading north to Albuquerque the scenery was nothing like as impressive, made worse by civilisation creating scruffy homesteads and advertising hoardings. With the cost of fuel and the shopping at 'Camping World' this was another expensive day. 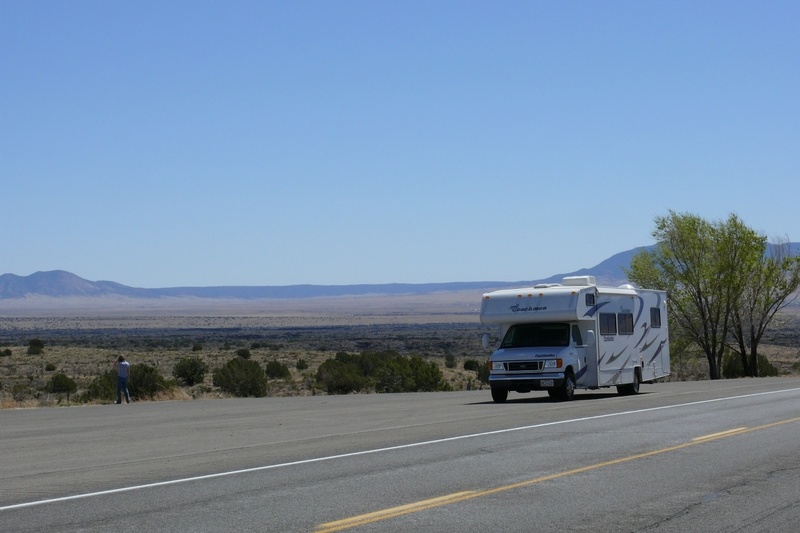 We had planned to stop at a Rest Area 50 miles west of Albuquerque and wild camp. Fortunately this did go to plan, and we have spent the evening here holed up in our vehicle. It’s been a bit of a one step forward two steps back sort of day but we are learning more and more about the vehicles systems. Tonight it’s Spaghetti Bolognese on the cooker,with the extractor fan sucking the heat and smells out, washed down with red wine. We’ve had the MP3 player entertaining us with music all evening, the phone is being recharged, and the water is being heated by propane gas which means we might just get a hot shower in the morning before we set off for Williams. LOCATION TONIGHT: Rest Area off junction 104, 140, near Albuquerque.